Trump has said he wants a concrete barrier as high as 55 feet tall and has described his proposed wall as "impenetrable, physical, tall, powerful, beautiful." 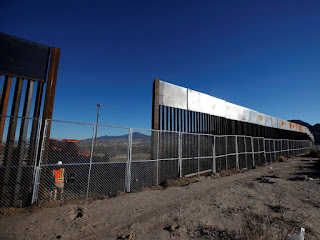 Under the Secure Fence Act, the pedestrian border fencing completed in fiscal year 2007 was estimated to cost about $2.8 million per mile, according to a 2009 report from the Government Accountability Office. It was constructed using mostly the U.S. Army Corps of Engineers and the National Guard, according to the Congressional Research Service. The 2009 report also found that fencing constructed in fiscal year 2008, which mostly used private contractors, cost about $3.9 million per mile. Building a new 1,000-mile wall could cost as much as $40 billion, according to an analysis published in the MIT Technology Review. Maintenance of barriers along the southern border will also be costly. The Congressional Research Service estimated in 2009 that double layer fencing would cost an estimated $16.4 million to $70 million per mile over 25 years, depending on the amount of damage sustained. During Wednesday's press conference, Trump did not specify how he plans to pay for the wall, but in the executive order he asks to allocate available sources of federal funding to the "planing, designing, and constructing of a physical wall" as well as to project long-term funding requirements from the Congressional Budget Office. He also calls for each executive department and agency to identify and report all foreign aid to Mexico. Earlier this month, Trump said that Mexico will reimburse the U.S for the cost of building the wall. Mexican officials have repeatedly said they will not pay for the wall. On Wednesday, the new president said that he has "deep admiration for the people of Mexico," adding that he looks forward to meeting with Mexico's President Enrique Peña Nieto and that he "truly" believes that the U.S. and Mexico can improve relations going forward. Peña Nieto may cancel a visit with Trump scheduled for next week in response to today's announcement, a Mexican official told ABC News. The Mexican president has been under fire in his country recently for being seen as too accommodating to Trump. During his confirmation hearing earlier this month, newly-minted DHS Secretary Gen. John Kelly said that "a physical barrier in and of itself will not do the job." "It has to be a layered defense," he said, adding that even with a wall extending from the Pacific Ocean to the Gulf of Mexico, you would still have to back that wall up with patrolling by human beings, sensors and observation devices, he said. Border Patrol already employs a "digital wall" composed of about 8,000 cameras, which monitor the southern fence and ports of entry. Its resources also include more than 11,000 underground senors, 107 aircraft, eight drones, 175 mobile surveillance units and 84 boats.